Canon Daniel Nuzum (who is an accredited Healthcare Chaplain working at Cork University Hospital, Marymount University Hospital and Hospice, and the Bon Secours Hospital, Cork) recently completed CPE to Advanced Level under the supervision of Sr Mary Jo Corcoran, Director of CPE, Cork University Hospital. Clinical Pastoral Education (CPE) is the formal method of education for those involved in or preparing for pastoral ministry. CPE is an essential requirement for accreditation as a healthcare chaplain in Ireland. 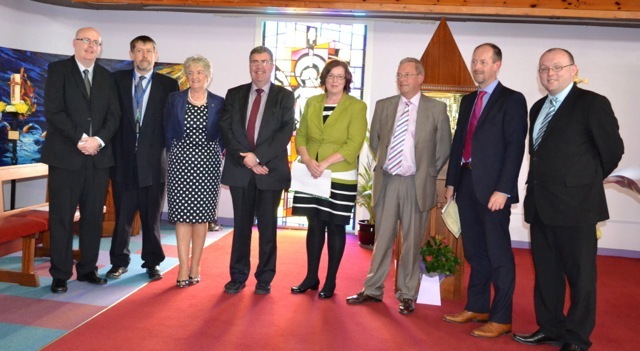 At the presentation of CPE awards recently were (L-R Mr Damien Quigley, Rev Bruce Pierce (Chairperson ACPE Irl), Sr Mary Jo Corcoran, Director CPE Programme CUH, MR Pat Nugent, Ms Tara Kavanagh, Mr Tony McNamara, CEO, CUH Group, Canon Daniel Nuzum, Mr James O’Reilly. CPE is an action –reflection – integration model of learning overseen by a trained supervisor involving 400 hours of supervised ministry, education, interpersonal group work and individual supervision. Although it most often takes place in a healthcare setting it can also be adapted to all ministry settings. One unit of CPE training is provided at Cork University Hospital and an extended Unit over twenty weeks is also run at the St Luke’s Home Education Centre, Cork. For further information about CPE please visit the ACPE website. This entry was posted in Chaplaincies, Church in Society, Clinical Pastoral Education, Community Involvement, Continuing Ministerial Education, Healthcare Ministry, Saint Luke's Home Education Centre and tagged Canon Daniel Nuzum, Cork University Hospital, Rev Bruce Pierce, Sr Mary Jo Corcoran. Bookmark the permalink.